← Chicken, Rice, and Beans- Cuban Style! Earlier in the week, I emphasized how wonderful it is to snack on a delicate, crisp apple chip. Now meet her sturdier snack cousin, the sweet potato chip! These chips are made using the same method as apple chips with just a few tweaks. The biggest change is that I use my mandoline to slice them a little thicker. 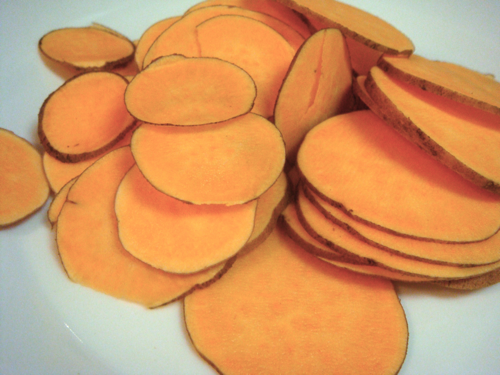 The thicker cut makes the sweet potatoes perfect for scooping dips, a unique and healthy alternative to tortilla or plantain chips. who knew sweet potatoes had such a cool pattern on them? To make these chips, pre-heat your oven to 300ºF. 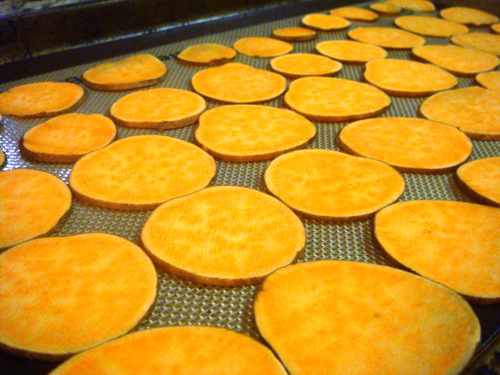 Then, slice your sweet potato and lay it out on a baking sheet lined with a silicone mat. The mat helps the chips cook evenly and prevents them from sticking. Put them in the oven for 15-20 minutes until they just start to brown. Your nose should know when the chips are done because your kitchen will start to smell like sweet potato fries! Yum. Take the chips out of the oven and let them cool until they’re completely crisp. While these chips are great eaten on their own, they are even better when you use them to scoop an avocado straight from its shell. 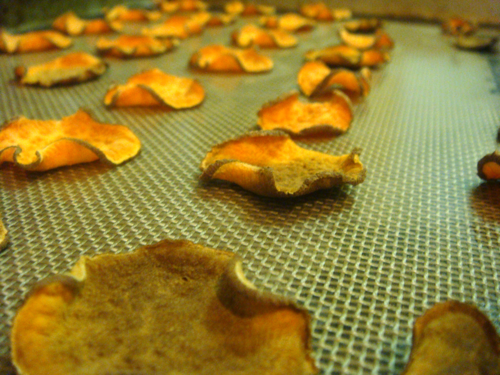 In fact, this was the reason I figured out how to make sweet potato chips in the first place. 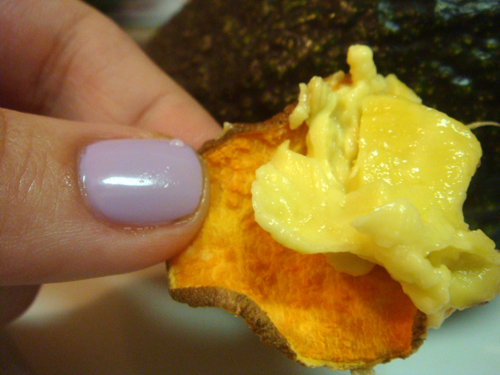 I love eating perfectly ripe avocados with plantain chips, and I was looking for a healthier replacement. As with apple chips, the one bad thing about these sweet potato chips is that they don’t stay crisp for more than a few hours. They’re still really good to eat when they’re chewy, but you can quickly re-crisp them by putting them in the oven for a minute or two. For those of you who are interested (I get the hint, commentors!) Stella loves sweet potato chips. She doesn’t like raw sweet potatoes though. When I put a slice in her food bowl, she picked it right out and put it on the floor. But she couldn’t get enough of the final product. And neither can I! And for those of you admiring my nail polish (which I’ve been doing for the last several days), it’s Essie’s Nice is Nice. Figures I’d fall for the French color. It’s very long-lasting, but a pain to apply. I just tried your recipe WITHOUT having a mandoline or a silicone baking mat. I just used a sharp knife and a regular cookie sheet. Excellent! I can see this becoming a very frequent snack for me. So easy and very yummy!! Thank you!